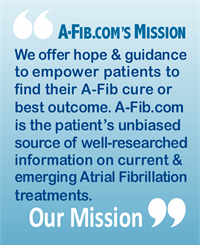 Our newest patient A-Fib story is told by a retired nurse from Arizona. 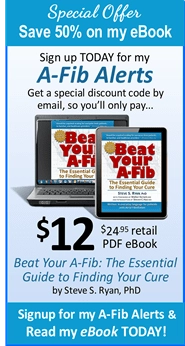 (Coincidently, her husband had A-Fib, too.) Both are now A-Fib free. Her story begins in an all too familiar way. My first episode started in September 2006 when I woke up at 2 AM with an urgent need to urinate. My heart was beating so hard that I thought it would come out of my chest. My pulse was irregular, I had chest pain and was dizzy. I was anxious and scared. At the emergency room, just before I was scheduled for a cardioversion, to my great relief, I went back into sinus rhythm. 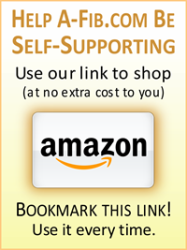 I was discharged with a ‘pill-in-a-pocket’, Flecainide 100 mg, if I got another episode. I thought I would be free from other episodes. But 10 months later I woke up at 1 AM again with an urgent need to urinate. My heart was beating out of my chest and my pulse was over 130 per minute. But this time I took Flecainide 100 mg and was back in sinus rhythm at 2:15 AM with a pulse of 68. Why Did I Urinate 10-15 During an A-Fib Episode? 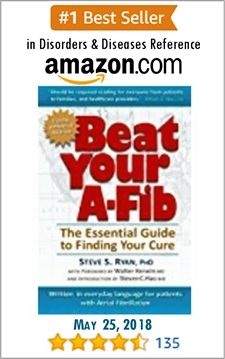 As my A-Fib became more frequent, I wanted to know why I urinated so many times (10-15) during an A-Fib episode. Apparently, when in A-Fib, the “atrial natriuretic peptide hormone” in the atria kicks in and acts as a diuretic to lower the blood pressure and regulate the calcium and salt in the body. My cardiologist instructed me to eat salty foods such as chips and nuts while in A-Fib and drink plenty of water so as not to get dehydrated. 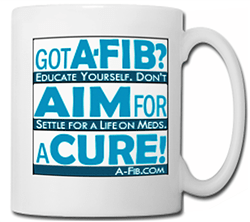 I was also told that my A-Fib episodes were vagal… . 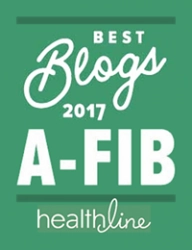 To read more of Lise’ A-Fib story and how she beat her A-Fib for more than three years, go to: Retired Nurse: Over 3 Years A-Fib Free (Husband Had A-Fib, Too).